Back in the 1960’s almost every local television station had some sort of childrens programming show on in the afternoon hosted by some costumed character. In the Oklahoma City area WKY Channel 4 (the NBC affiliate) had Foreman Scotty who was a cowboy and his show was western themed with a corral where children sat and he asked each one their name. On KOCO Channel 5 (the ABC affiliate) had Ho-Ho the clown and his sock puppet side-kick pokey. One of the odd things about the show was that Ho-Ho the Clown played the straight man to the sock puppet!?!?!? In the Early 1970’s, my mother worked at KOCO as a bookkeeper and I remember visiting her at work one day in the afternoon when I was out of school. I think I was waiting for her to get off work and we would go home together from there. She worked in a large room with many desks and the room had private offices along one side. On this particular day there was nobody else in the room or offices, it was just her and I. While I was standing by her desk and she was working, a portly older man walked into the room who was dressed in a brown checkered suit that could be classified as a selection from the “Herb Tarlek” collection. As he was walking by, my mother said to me “That’s Ho-Ho the Clown". I turned to look and he overheard what my mother said, and rushed into his office and shut the door. I was only about 10 years old at the time and was somewhat disappointed that he did not even say hello or acknowledge our presence in any way. About 15 seconds later the door BURST open and out stepped Ho-Ho the Clown in his clown vest, shoes, hat, signature red nose, etc. He didn’t have time to put on his make-up, but everything else was there including balloons and air horn. Ho-Ho came over to the desk where my mother and I were and put on a show for about 15 minutes just for the two of us, really just for me. At the end of the show he gave me an autographed picture (that I still have to this day) and some balloon animals. I’ll never forget that day, here was a man who was kind enough to take time from his day to put on a show for any child that would watch, even if it were only one child, standing in an office, waiting for his mother. Furthermore, he wanted to make sure that I received the full Ho-Ho the clown experience, so he dressed in as much of his Ho-Ho the Clown regalia as he could put on in 15 seconds, to make sure that I was NOT dissappointed. 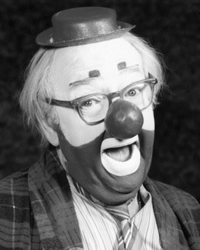 Later in life I learned that this was not unusual for Ho-Ho the Clown (Ed Birchall http://en.wikipedia.org/wiki/Ed_Birchall ). He had a long history in the Oklahoma City area of entertaining people in hospitals, schools, businesses, and their own homes. He was one of the most well known and beloved people in the state of Oklahoma. He also did childrens parties as Ho-Ho the clown, sometimes getting paid, usually not, but that was not his motivation. It was always very easy to see that his motivation was to make children happy, even if was only for a few minutes. I’ll always remember Ho-Ho the Clown as the greatest entertainer I ever saw.